One of the themes of smartphone design in 2017 has been manufacturers ready to ditch the bezels on the front of their devices for a full-screen look (albeit with a notch or two). We've seen phones like this from LG, Samsung and Apple, with others likely to follow. It's a welcome innovation at a time when everyone phone on the market was starting to look remarkably similar - but we can think of a few more ways that hardware makers can push smartphone design forward, from new input methods to fully flexible electronics. 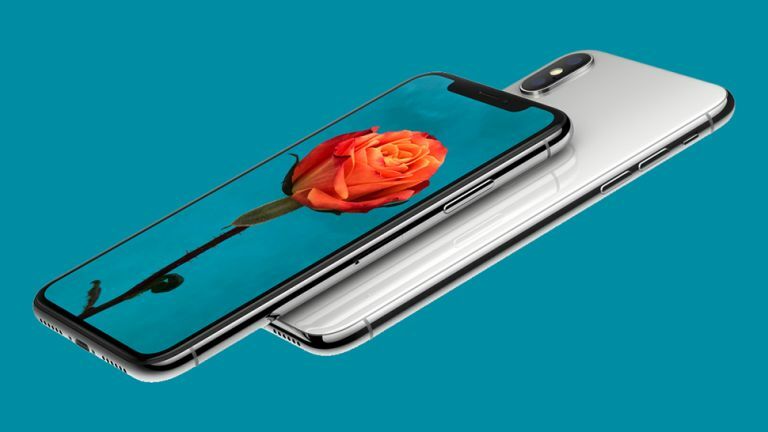 Come on Apple, you're not fooling anyone - fingerprint sensors have worked so well on phones because they can be grabbed at any angle, or even inside a pocket, and they function fine no matter what the lightings like or which direction you're facing in. We're sure Face ID is very swish and fast and everything but the sooner phone designers work out how to embed fingerprint sensing technology under glass, the better: and that includes Samsung and Google, and everyone else making phones, as well as Apple. There's no doubt that in general biometrics works better and is more secure than the old PIN system, and we're looking forward to designers continually upgrading their systems, so just picking up or even being near your phone is enough to unlock it ready for action. Having a simple, monochrome screen on the back of your device might seem a bit gimmicky at first, but it actually makes a lot of sense - it means you can see notifications and other information come in even when your phone is lying face down on a surface. As the YotaPhone showed, the rear screen doesn't have to be anything fancy. The front screen can take of photos and Netflix, while the one around the back can be used for reading messages and maybe articles on the web for a fraction of the battery power. Numerous handsets have experimented with secondary displays down the years with only limited success, but we reckon there's a lot of potential here. Not every app and alert needs a full display and we're hoping there are some noteworthy innovations to come. Once we've gone as far as we can with the phone display, the obvious next step is to go beyond the display... that could be VR, it could be projection, it could be holograms. We're already seeing next-gen technology like this in forthcoming devices like the Hydrogen One. Holographic and immersive displays have long been a staple of science fiction but the technology we have today is finally catching up - in the not too distant future you might be able to walk through a scene rather than just see a photo, all on your smartphone device. We're already partly there with 360-degree video and similar sorts of tech but as far as phone design goes, expect the display to go beyond what we know as the display in the next few years. Connecting to TVs and bigger screens will be a part of the upgrade too. The squeezable sides of the HTC U11 haven't exactly revolutionised the way we interact with our phones just yet, but we think there's plenty of potential in tweaking the way we tap and prod at our devices, taking smartphone input beyond a touchscreen and voice. Even little innovations like the way you can use the fingerprint sensor on the Google Pixel as a miniature trackpad are interesting and potentially useful. Speaking of the Google Pixel, the next model is rumoured to have the same squeezable edges as the HTC U11. Whether it's stroking the edges or tapping the back of a phone - or maybe even waving across the top of it, which is something Samsung has experimented with in the past - we'd like to see more intuitive methods for controlling a smartphone in 2018 and beyond. The idea of the foldable phone is one that's been around for almost as long as mobile phones themselves, but we had to wait until 2014 for even a slightly curved phone display from Samsung. Getting all the electronics in a phone to be flexible is a very hard ask. However, there are signs that we might finally, finally be getting somewhere - Samsung has gone on the record as saying it hopes to bring out a phone that's at least partly flexible at some point during 2018, though there are still some hurdles to overcome before then. Having a phone that you can fold up and slide in your pocket would be almost as much of a game-changer as introducing the touchscreen, and we're looking forward to seeing what designers can do with it. 2018 should be another exciting year for mobile phone fans.